“Don’t Worry, He Won’t Get Far On Foot” tells the story of John Callahan – a low-life, who only after becoming paralysed finds his own path and becomes a cartoonist. The film, directed by Gus van Sant, begins with Calahan’s accident during one of his booze nights, when he almost ends as a dead meat. After he is pinned to a wheelchair, he struggles with finding a way of fighting alcoholism. Thanks to the help of an AA group, John soon discovers he’s a talented cartoonist. Joaquin Phoenix is, hands down, one of the most talented actors that blessed the screen. His charisma carried many films and imbued dozens of roles with power that Phoenix oozes with. 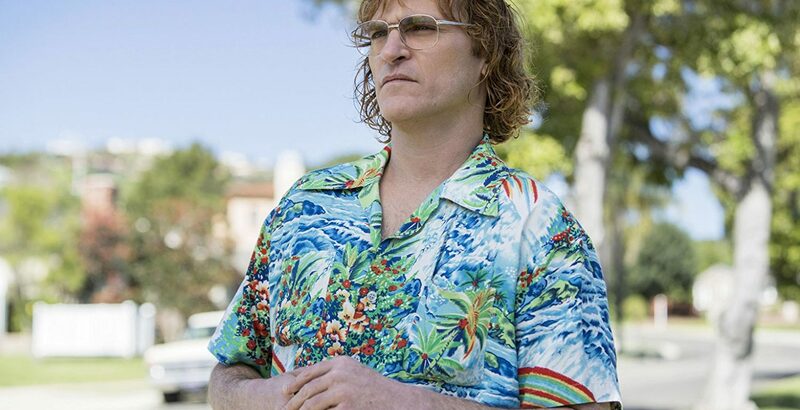 His work in “Don’t Worry, He Won’t Get Far On Foot”, belongs to the very same category and cements the incredible scope of Joaquin’s skills. As John Callahan, Phoenix strikes the perfect balance between creating a lovable character, a fragile man with weaknesses and a dramatic figure that serves as an axis for the whole story. There are layers to Callahan’s portrayal, unraveled with the story passing by. Sadly, although Phoenix’s work astonishes, the rest of the film is scattered, meaning that Gus Van Sant’s streak of messy efforts sadly continues (I still can’t get over “The Sea of Trees”). There are great ideas here and there, there is an intelligent dramedy and the cinematic grandeur at stake, but there is also the slow-to-death pace and an aesthetic that never becomes neither poignant nor exactly clear. While the slowcoach narrative could be rationally explained, the latter becomes a real bugbear. The beginning of “Don’t Worry, He Won’t Get Far On Foot” is dressed in the document clothes, allowing an AA meeting to feel like a real confession-session. Needless to say, it sets a certain mood – an approach we hope to follow now on. Van Sant is not consistent though, as if the need in determining a certain rhythm loses its importance. 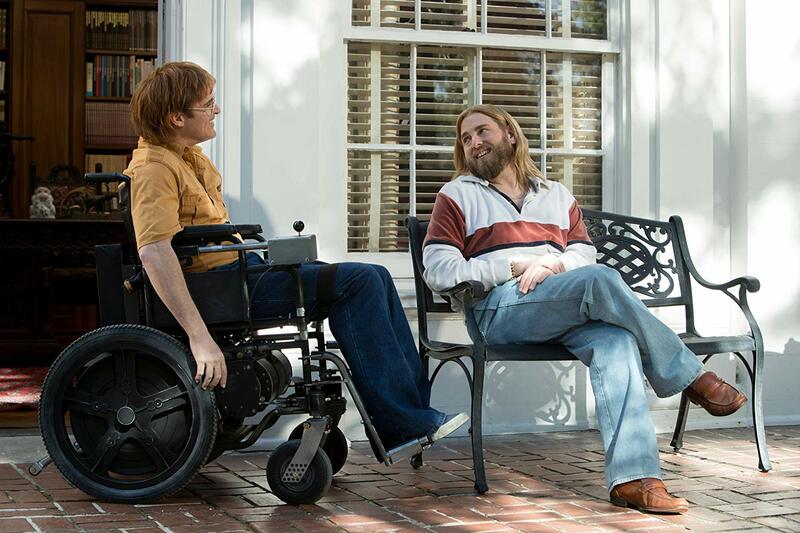 After awhile, almost as if duly noted while editing, “Don’t Worry, He Won’t Get Far On Foot” turns into a rather shapeless experiment, where dark humor, existential philosophy and happy-ever-after biopic are expected to go together. It’s mirrored in the cinematography and visual architecture of the film too. There are bits of animation (which are a great way of breathing life into Callahan’s work on-screen by the way), along with memories, recollections of meetings and long conversations. There is dynamic camera shots, there is even a carousel – the pot is boiling, but the water’s massively overflowing. Needless to say, the more Van Sant tries to spice things up in “Don’t Worry, He Won’t Get Far On Foot”, the more disarranged it all gets. At some point, Callahan’s alcoholism is moved backwards only to give space for a naive sketch of his career as a cartoonist. And Callahan’s story is not a “tropy” tearjerker – he literally hit a rock bottom only to find enough self-confidence to blossom into a responsible man with a degree of control over his life. However, in the lenses of van Sant’s directing, this story becomes an exercise of an unfastidious form. While I enumerated a lot of Van Sant’s wrongdoings, by no means do I claim that “Don’t Worry, He Won’t Get Far On Foot” is cinematic failure that should be quickly forgotten. On the contrary, it’s a decent film, where a lot of memorable parts and tasteful acting constitute enough value to beat many other titles from 2018. Having said that, there was a lot of calling for more profoundness from an early stage of the film. And that might leave you just neutral to a whole lot of effort put in “Don’t Worry, He Won’t Get Far On Foot”.